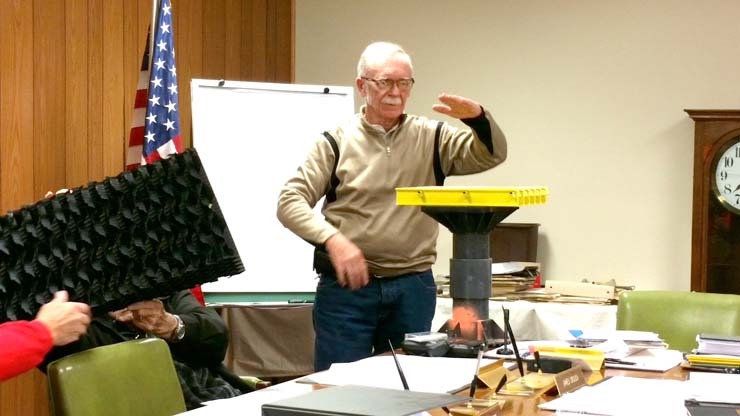 Mayor Roy Kissel shows the board some of the parts being installed at the sanitary plant. The Norris City Village board voted unanimously to amend the alcohol ordinance, adding another Class C restaurant license (this now makes 2) and adding the word “spirits” to the current wording, which allows for the “purchase of beer and wine on the premises with the purchase of a meal.” Ordinance 018-08 makes room for new restaurant El Mexicano to begin serving Margaritas and other hard liquor-based drinks along with its Mexican fare. El Mexicano’s application for the license in Norris City has been submitted, along with liability insurance, and is awaiting approval and payment of the fee, which remains at $1000 per year. Two board members, Norm Trousdale and Sue James were not present to vote. In other business Monday night, the board approved a levy increase of $184,580.00. The municipality is allowed a 4.99% increase and strives to stay under that amount. The increase is divided up this way: $24,000 general administration; $5800 disposal of garbage; $62,000 general liability insurance; $35,000 retirement; $34,000 Social Security tax; $12,000 audit; $5550 police; $1850 ESDA; $2570 fire protection; and $1135 unemployment insurance. Keith Botsch of Botsch and Associates was on the agenda, but was not present. The minutes and treasurer’s report were approved and the November bills were also approved for payment. The bills for purchases for the Dale Park were only recently received. The mayor stated there are people in town selling electricity rates and knocking on doors. He said that the municipal aggregate rate now stands at .06285 per kilowatt hour and is good to the end of next year. The sellers are very pushy and can confuse homeowners. He urges all citizens to call him if they have any questions about the electric rate. The board voted to pay $149 per month for four months for a sponsorship ad package of NCOE basketball on WROY/WRUL. Both wells have now been acidized and the mayor was pleased to report they are back to functioning as when they were first drilled. The board approved the following payments for work on the Sanitary Plant: Payment #1 for $3217.50 and Payment #2 of $163,357.65 to the contractor. Payment #3 in the amount of $10,455.62 goes to Brown and Roberts Engineering firm. The mayor has received some new rates for the water line repair that are much better than the ones reported at the last meeting. He stated that the excavating can be done for $5020 and he has a rate of $4200 for the supply of pipe, making the whole project total less than $10,000. At the last meeting, the rate reported was $35,000 for this job. The mayor stated he was online looking at a satellite map of the property where the uncovered pipe is located and could plainly see the section of pipe on the map. The board skipped the Camping Trailer/Mobile Home ordinance that was on the agenda; no reason was given. TIF projects report: Mrs. Wilkerson will not finish the housing development. The board voted to shift this development to Jennifer Davis and Davis Construction to purchase, complete, and sell in Ordinance 018-09. The Mayor will proceed on two new TIF projects for Jerry Vailes and the Neals. The Village is considering replacement of windows and doors on downtown buildings, assisting both entities with about $8000 each in upgrades. The board gave its approval to the schedule of meeting times and dates for the 2019 calendar year. The board is looking at doing some work at Beaty Field, upgrading the backstop and fence. The mayor said they were looking at spending approximately $22,000 for the whole job, taking down what is currently there and installing the new. The mayor received a letter from the White County Sheriff’s Department concerning a new fee for dispatch services. Since it just arrived on Monday, it was too late to be put on the agenda. The board was asked to read it and the mayor will get more information to them as it becomes available. The board went into closed Executive Session at 7:59 p.m. and came out at 8:14 p.m., after which they voted to give all part time and full time village employees a .50 cents raise per hour. The Mayor reminded the board of the Christmas dinner on Dec. 15.